B&H Photo Video, one of the largest online camera retailers, posted a price for the recently-announced Samsung Gear 360, at $399.99. This price would be fairly competitive among currently-available 360 cameras with comparable specifications. For example, the popular Ricoh Theta S, with about half the resolution of the Samsung Gear 360, is $349, The single-lens 360fly is about $399.99. 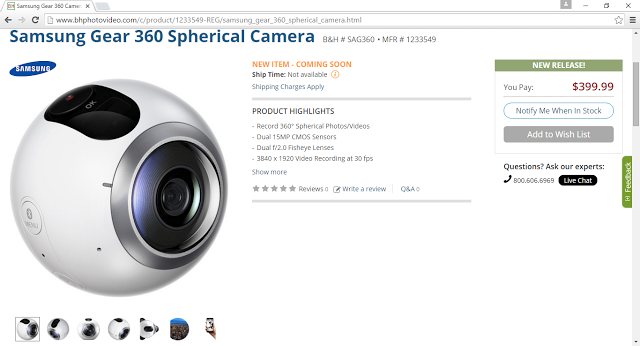 Thus far, no other retailer has posted a price for the Samsung Gear 360, so this price might just be B&H’s estimate.